U.S. #3167 pictures F-16c’s of the Air Force’s precision flying team, the Thunderbirds, flying in diamond formation. After 40 years and two wars, the aeronautical division of the U.S. military was established as its own branch, the Air Force, on September 18, 1947. What would later become the Air Force was originally created as an aeronautical division of the Army Signal Corps in 1907. The next year, the Army purchased its first plane, and in 1911, Congress appropriated funds for aviation. Control passed to the aviation division in 1914. U.S. #C49 pictures the Boeing B-52 Stratofortress, which was first flown in 1952. After the U.S. entered World War I, it became apparent that aviation was going to play a major role going forward. So President Woodrow Wilson created the U.S. Army Air Service. By the end of that war, American pilots in 45 squadrons destroyed 832 enemy aircraft and balloons. After the war, creating a separate air corps was debated extensively, but was rejected due to budget limitations. In 1926, Congress established the U.S. Army Air Corps. Adolf Hitler’s invasion of Poland in 1939 led the U.S. Air Corps to expand its personnel and equipment. The Army Air Forces was officially created in June 1941 and grew even faster following the attack on Pearl Harbor. Under the command of General Henry “Hap” Arnold, the Army Air Forces sparked a major expansion of the American aviation industry. 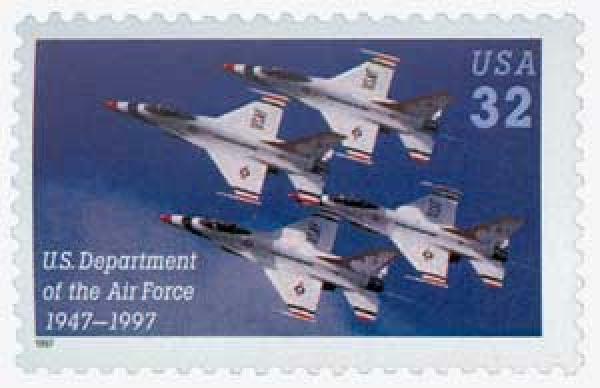 At its peak during the war, the Air Force had 80,000 aircraft and 2.4 million personnel. Flying planes including the C-47 Skytrain, P-51 Mustang, B-17 Flying Fortress, and B-29 Superfortress, the Air Force participated in every theater of the war. As the war came to an end, the Air Force was demobilized along with all other military branches. However, recognizing their accomplishments, President Harry Truman signed the national Security Act on September 18, 1947, creating the U.S. Air Force as its own independent branch. Click the images to add this history to your collection. This entry was posted in Sept. 2015, This Day in History. Bookmark the permalink. 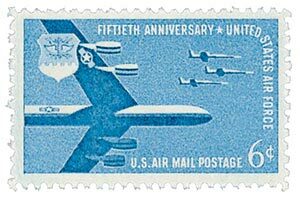 12 Responses to "This Day in History… September 18, 1947"
I love history and have enjoyed all these articles on our history through stamp. I especially enjoyed this one having spend 21 years in the Air Force from 57 to 79. I still believe that Billie Mitchell was correct and the creation of this organization proves it. Thank you for your service, Stu. U.S. military airplanes were first used in the campaign against Pancho Villa in the Mexico Revolution era in 1914. U.S, sent a squadron. I have a photo postcard that shows about 10 airplanes. I was in the Air Force from 1956 to 1960. reading some of the early history was a delight. Keep up the good work. Have you thought about publishing these tidbits? I’m sure many people other than stamp collectors would enjoy this refresher course on such a great country. Thank you for your service, Ronald. I never forget that time in Korea!! and all the mail I received………..
HEY SWAM BEING A MEMBEROF Truman’s POLICE FORCE I HOPE YOU READ THEM THEIR RIGHTS BEFORE ARRESTING THEM! As a proud veteran of the United States Air Force, I thank you, Mystic, for this Day in History salute to its being established as an independent branch of the armed forces of our country 68 years ago today. Go Air Force! Thank you for your service, Jerry. I , too, served 20 years in the U.S. Air Force . Served a year in Viet Nam 1970-1971 , 6 months TDY on Guam that was immediately after Viet Nam , that was supposed to be only 30 days that turned into 179 days . The 179 days was so that the Air Force would not have to credit me with a permanent change of station . The French fought in the south east Asia area for about 20 years and finally had enough sense to give up and left the area . Then the Great United States thought we could finish what the French started and we started where they left off for another 20 years or so . Then we did the same thing we did in Korea , divided the country and left after getting so many of our young men killed , What For ? ? ? But wait , isn’t that what we did in Germany as well , but that is a different story . Now we are in the middle east and doing the same thing again . All countries should do what we did , have a Revolution , and the side that wins is the government . And we should not stick our nose into every countries’ business , WHO made us GOD . Let’s go to China and tell them what government they should have or Syria or Iran or Iraq . I’ll bet they would really like for us to do that . We are not the police of the world , and we need to stop acting like we are . Shame on U. S. us . You’re a great American Patriot! Thank you for your service! these are interesting, but of course done elsewhere ad infinitum. What Mystic could do, and it would be UNIQUE, is to write the story of each individual stamp, its history from conception(whose?) to execution. Discuss the artwork and artist(ideally with his input/story). Then the printing with problems/changes/choice of how to print and why and how the execution turned out. Also a detailed description of the picture; in this case, B-52 AND F104’s(which were highly stylized) Also any mistakes that made it to the hands of collectors. You could do volumes in categories(time periods/topics/comments etc.) I would pay any reasonable price for a beautifully published book like this($50-$100). Where else can you get this? I haven’t found it. Or you could make it like those collection binder pages with a picture of the stamp so in this case, no expensive art work, the stamp itself would be placed there. Exciting!